Now that I’ve burned through a set of tires on both my Krampus and my Pugsley, I feel like I can make a good comparison. I’ve been riding the Pugs since last Feburary, and the Krampus since this July. 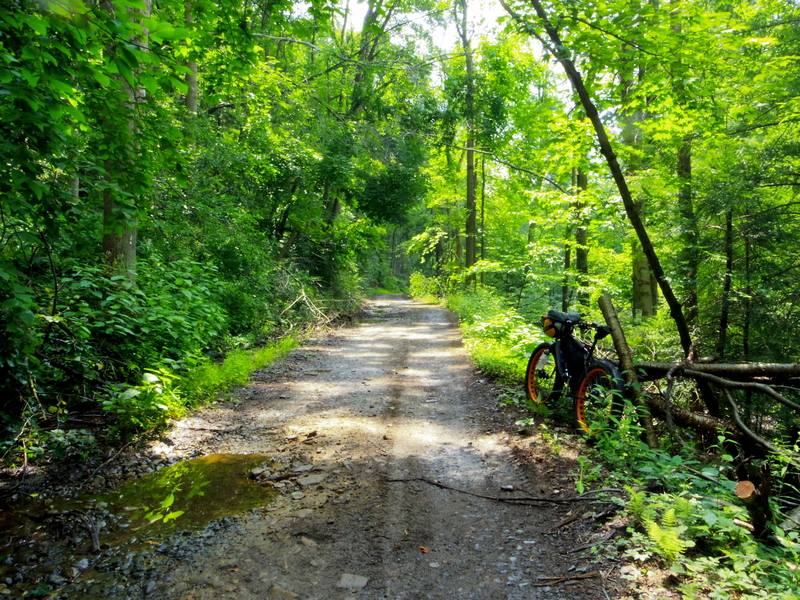 Before I built the Krampus, I did most of my mountain bike rides on the Pugsley. The Krampus has 29×3.0 tires and is a trail bike, since it’s at its best on singletrack. The Pugsley has 26×3.8 tires and is a flotation bike, since it’s at its best in soft conditions. I have a blast riding my Pugsley on singletrack, but I still wouldn’t call it a mountain bike, because dry conditions aren’t ideal for a fat bike. Similarly- even though I can ride a cross bike on some singletrack, and it can be kinda fun, I wouldn’t call it a mountain bike either. A fat bike has a few funny handling traits- when you lean it over, the huge tire flops to the side and starts to self-steer. At high speed over rough ground, the tires start to bounce like basketballs, until they’re bumping around so fast that it’s almost impossible to get the bike to slow down and turn. 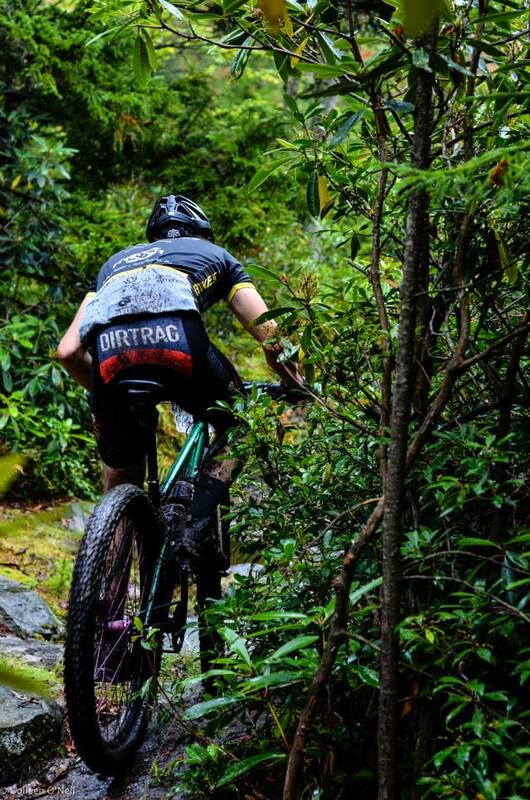 And creeping down slickrock, if you hit the front brake, a fat bike tire starts to skip and bounce until the whole front end of the bike is shuddering. The Krampus doesn’t do any of that stuff, so it’s not a fat bike. Instead, it’s everything that a 29er should be. Lots of traction, easy to control, maneuverable, and genuinely fast. In a few rocky races I did this year on my single speed Krampus, I finished third overall behind guys on carbon full-suspensions. The courses were pretty rough, and there’s no way that I would have finished so well on a rigid 29er with standard sized tires. And weirdly, my rigid Krampus is more comfortable on long rides than my Kona Honzo was with a 120mm fork. 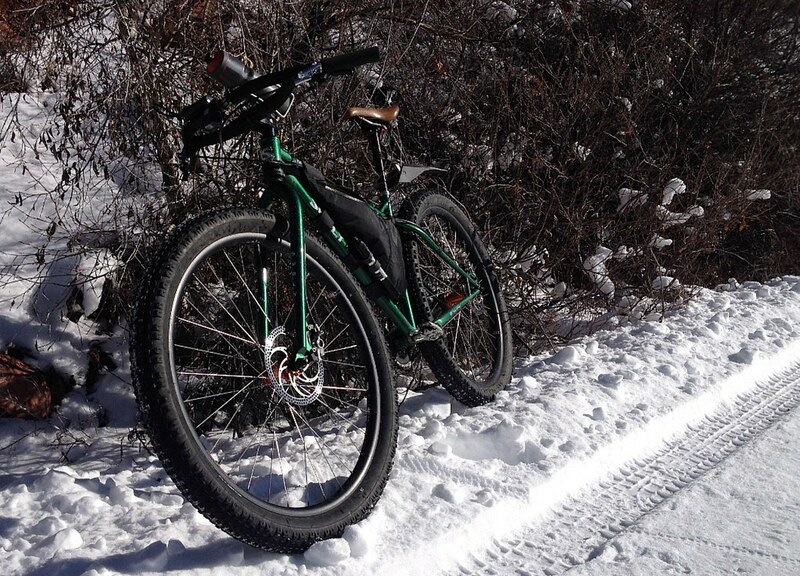 Since it’s not fat bike, the Krampus is way worse in most snow than the Pugsley. 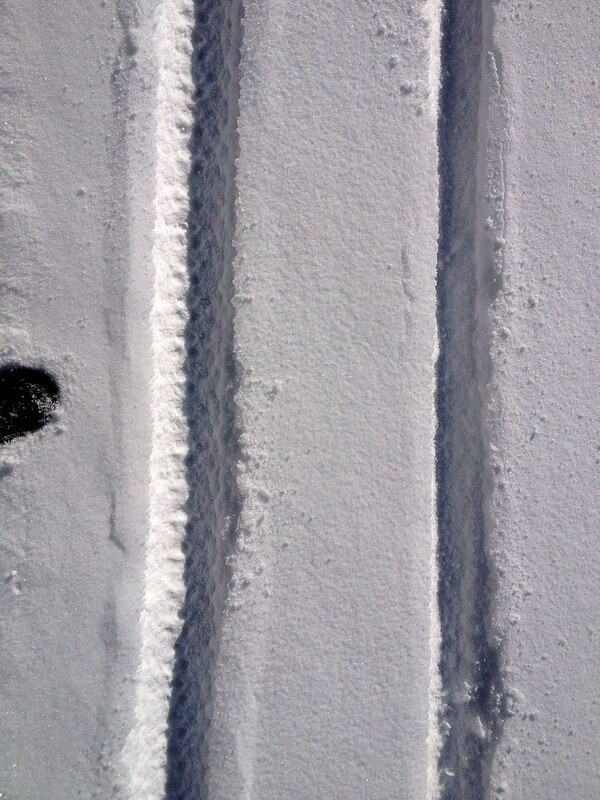 The Pugsley track is on the left, Krampus on the right. 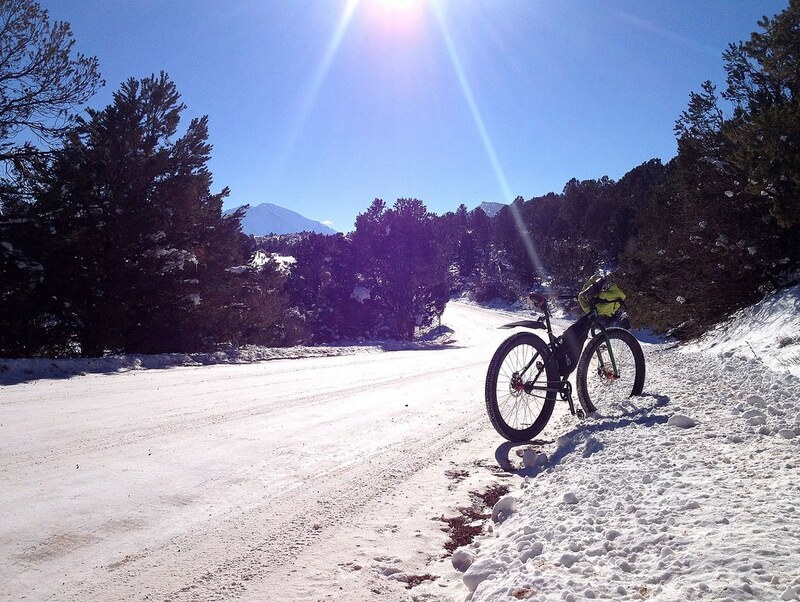 The Pugsley makes a nice clean track, with a clear tread pattern because it’s easy to control in the snow. The Krampus goes through snow better than a bike with 2.2 tires, but it still slides around a bunch. The Pugsley is better in un-tracked, or melting snow. It’s also better on narrow snowshoe packed singletrack, just because it’s too hard to keep the low-tread Krampus tires from slipping off the trail. But on snowy packed roads, the Krampus has plenty of traction. It’s also faster and less work to pedal. I do like riding my Pugsley in the summer, but mostly because it’s silly and a fun way to switch things up. All that extra tire is really unnecessary in dry conditions. If I’m out for a ride longer than a couple hours or trying to keep up with someone on a normal bike, the extra drag starts to get frustrating. So for normal trail conditions- summer, hard-pack snowy roads, pavement, and technical singletrack I like the Krampus a lot more. For snow riding, and cruising to the brewery to eat some beef and drink beer, I grab the Pugsley. I like both bikes a lot, and I’d rather ride either of them over a skinny-tire mountain bike. But if I had to keep just one bike, it would be the Krampus (I would be really sad to get rid of my Pugsley though.) Excluding a few specific conditions, the Krampus is faster and more fun. Excellent find! Thank you for the write up and comparison. I have a tough choice because I live in interior Alaska and the snow is a permanent part of the terrain for 6 months strait. I really want the Krampus for all the reasons you list however the Pugs seems like the ideal bike for our conditions. Very nice comparison. No question the narrower tires are faster on trails and fire roads. However, I live in New Mexico were fat tires enable new desert routes daily. I also have a set of rabbit hole 29er wheels that are fun on the hard pack but the freedom those fat tires give is awesome. Remember, a Pugs makes a decent 29er with rabbit holes but you can’t turn a Krampus into a fat bike! Totally true. I’d hate not to have a fat bike- my riding in the winter would be really limited. The times that I’ve been down in the desert and rode sandy stuff, I thought the 29x3s worked great through. Not enough float for your boat? Awesome article. Thanks for the post!